A long-vanished land between Australia and Antarctica has become a little better known to us, thanks to analysis of fossilised jawbones found on the Victorian coastline. Millions of years before wallabies, a wallaby-sized dinosaur was grazing prehistoric herbage in a long-vanished valley between the continents we call Australia and Antarctica. 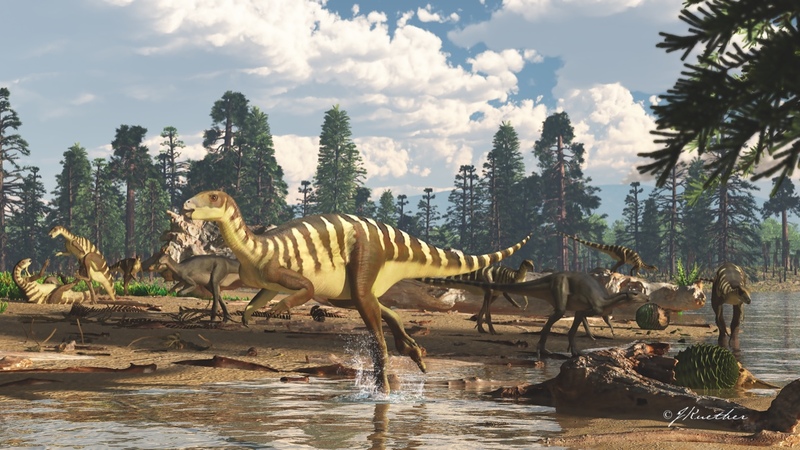 Newly identified from fossils in 125 million year-old rocks by University of New England (UNE) postdoctoral fellow Dr Matt Herne, the little dinosaur has been named Galleonosaurus dorisae. Galleonosaurus ran upright on powerful hind legs in the vast forested floodplain of the rift valley between the slowly tearing-apart continents. Dr Herne and his colleagues identified the dinosaur from five fossilised upper jaws found in rocks from Bunurong Marine Park in the Gippsland region of Victoria. Unusually, the fossilised jaws include young to mature individuals — “the first time an age range has been identified from the jaws of an Australian dinosaur”, Dr Herne said. Galleonosaurus refers to the shape of the upper jaw, resembling the upturned hull of a sailing ship called a galleon; dorisae honours the work of Dr Doris Seegets-Villiers, who produced her PhD thesis on the palaeontology of the locality where the fossils were discovered. It is the fifth small-bodied ornithopod dinosaur named from Victoria. This diversity of ornithopod, not seen anywhere else in the world, paints a picture of an environment especially hospitable to these small dinosaurs. At the time of Galleonosaurus, sediments from a 4000 kilometre-long massif of large, actively erupting volcanoes along the eastern margin of the Australian continent were carried westward by large rivers into the Australian-Antarctic rift valley, where they formed deep sedimentary basins. As sediment washed down the rivers they picked up and eventually encased the bones of dinosaurs and other vertebrates, along with fallen trees. The jaws of Galleonosaurus were discovered by volunteers of Monash University’s Dinosaur Dreaming project, in conjunction with Museums Victoria, during excavations near the town of Inverloch. The most complete jaw and the key specimen of Galleonosaurus dorisae was discovered in 2008 by the seasoned fossil hunter Gerrit (Gerry) Kool, from the nearby town of Wonthaggi. Gerry and his wife Lesley have been instrumental in organizing the Dinosaur Dreaming excavations along the Victorian coast for 25 years. These excavations have been spearheaded by Professor Patricia Vickers-Rich of Monash University and Dr Thomas Rich at Museums Victoria. Dr Herne’s analysis of the Galleonosaurus fossils was aided by rapidly advancing technologies, such as 3D micro-CT scanning and 3D printing, which are helping bring new anatomical information to light. His find is reported in the latest edition of the Journal of Paleontology.